Oracle might have been called Roar3. It is a bit longer and lower than Roar2 so it looks sleeker. It is actually closer in shape to my Toto canoe. I'm pretty sure it is a visual improvement over Roar2. Hard to say if it is a practical improvement. Being lower sided it might seem less secure but then again my Roar2 has never taken water over the wale in the ten years I've had it and maybe I've been hauling around excess freeboard. Max Wawrzyniak of St. Louis made the prototype. We rowed our boats side by side on a good day recently. I'd say the Oracle was 1/2 mph faster all around going about 4 mph at cruise and 5+ mph on the gps at full effort. It should float two adults quite nicely. I'd like to point something about the way I draw the line on many of my boats. I make card models of my designs which help me check the panel expansions and allow me to get a 3D check of the shape. The models are done in the same scale as the blueprint, in this case 1/8 and the model is fairly large. So I knew that Oracle has nice curves all around. But if you look at the end view in the lines drawing you see all straight lines! 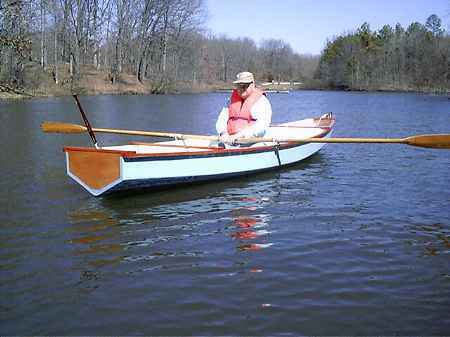 In a way this is a throwback to the original "instant" boats which had hull panels made from straight saw cuts. It is easy for a designer to make the jump to more flexible shapes, that is hull shapes which can look like about anything you might imagine being made from plywood. Back when I started drawing boats I noticed some of the nicest shapes in 3D had end views made totally of straight line segments. Don't ask me why. Not only does that give a nice shape, the designer's job is simplified. For example, with Oracle I might start by drawing the top view. Then I might sketch in the side view needing nothing more than an idea of what the stem, midsection, and stern will look like. Next I draw the end view which will include those elements connected by straight lines. In normal mechanical drawing it only takes two views to totally define an object. So without even drawing the side view of the boat the shape is defined. It only remains to go back and figure it out and adjust the top view, etc., etc.. Happy is the designer who gets it right the first time through. 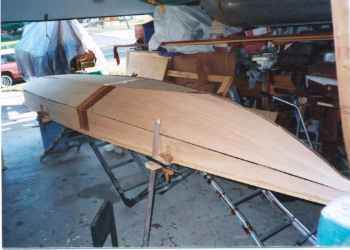 Oracle is built with taped seams using four sheets of 1/4" plywood. No jigs, no lofting.